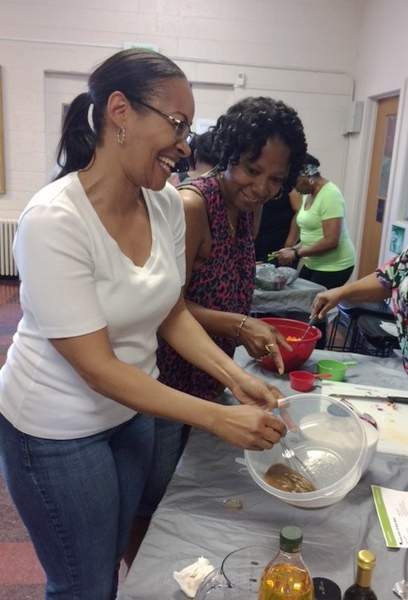 Courtesy St. Joseph Community Health Foundation Elethia Davenport, left, and Lisa McPherson enjoy making salad dressing during an Our HEALing Kitchen class at the Albert G. Jennings Recreation Center on McCulloch Street. Our HEALing Kitchen cooking classes, offered through Brightpoint, will run through early October at the following locations. Contact Sharon Tubbs at stubbs@sjchf.org to register. Hopewell Pointe, 8033 Community Lane, Fort Wayne; Tuesdays, 5:30-7:30 p.m.
Cameron Crossing, 15079 Carmel Lane, Huntertown; Thursdays, 11 a.m.-1 p.m.
Tamera Senior Villas, 7045 John St., Fort Wayne; Fridays, 11 a.m.-1 p.m. Reality settled in when I moved back to the Summit City after living away for nearly two decades. The old east-side house where I grew up, where my parents still lived, now stood in a food desert – a neighborhood lacking nearby grocery stores selling fresh fruits and vegetables. Rogers on North Anthony where my mother shopped during my childhood? Long gone. The old Scott's on East State where I once cashiered after school was just a memory, too. The closest supermarket begged a 3.5-mile drive, and similar stories held true in neighborhoods throughout southeast Fort Wayne. So when I joined the HEAL effort last spring, I felt the mission, not just professionally but personally. HEAL (Healthy Eating Active Living) is co-sponsored by the St. Joseph Community Health Foundation and Parkview Health, and the program has two main initiatives. The first breaks down access barriers to getting nutritious fruits and vegetables by hosting summertime farm markets in food desert areas. The second offers cooking classes that teach the importance of incorporating fresh produce into people's daily diets. There is no doubt that Fort Wayne needs this. According to a 2016 Trust for America's Health report, Indiana's obesity rate is 15th highest in the nation. The U.S. Department of Agriculture Food Atlas says that more than 900,000 Hoosiers live in census tracts considered to be low-income and with low access to healthy and affordable foods. The latest edition of Dietary Guidelines for Americans says that about three-fourths of the population doesn't eat enough fruits and vegetables, while other studies found that healthy eating can lower blood pressure, prevent some cancers, and reduce the risk of heart disease, stroke, diabetes, and digestive problems. They include many of my relatives and friends – and yours, too. They include people like Belinda Beiswanger. She's a 61-year-old who suffered from aching knees, hair loss and low energy. Since taking the HEAL cooking course at Tabernacle Baptist Church, she has planted her own backyard garden and changed her diet. Now her hair is growing. She's lost 30 pounds, and her knees feel good. They include teens who took the same class this summer at the Boys and Girls Club. Kitchen coordinator Charita Smith schooled them on the difference between tablespoons and teaspoons. Some chopped vegetables for a power salad for the first time. A few looked skeptically at the long green bumpy things. They had never tasted cucumber. Since expanding its outreach last year, the summertime program has affected adults and youth citywide. HEAL Farm Markets logged more than 1,200 visits last summer. About 400 people are expected to complete the Our HEALing Kitchen cooking class by this fall, compared with about 200 last summer. In surveys, participants say they're eating more fruits and vegetables now that they know the crucial benefits and have learned creative ways to cook produce. They are the likes of Millye Hunter, a 56-year-old stroke victim who walks with a cane. She struggled to cut back on fried and processed foods, despite doctors' orders. Yet, four weeks into the HEAL course at Peace Lutheran Church, she eats meals amounting to five cups of vegetables and fruits daily. She can hardly believe the energy boost. “I feel good!” she says. She even walks steadier on her feet, church friends say. At the city's Albert G. Jennings Recreation Center, women ranging in age from 20s to 70s swooned over the asparagus soup they cooked together. Several had never tried the vegetable. They're grateful to “discover new veggies that they will eat,” said Chantell Davis, who works for the city's Parks and Recreation Department and facilitates the class. The course launched in 2014 with pilot sessions at women's shelters, then expanded to 29 sites last year. This summer it expanded to 42 sites, hosted by churches, transitional housing facilities, homeless shelters, social service agencies and youth programs. All are encouraged to take advantage of low prices at HEAL Farm Markets, too. A boy of about 9 years old is learning early. He lives in McCormick Apartments and has shown up at the nearby HEAL Farm Market every Wednesday for the past two summers. He found a way to earn $3 HEAL coupons by participating in a related program for kids. Each week, he picks out exactly $3 worth of fruit and proudly hands over his paper currency for the exchange. He bites into a juicy plum, then he scurries off home. 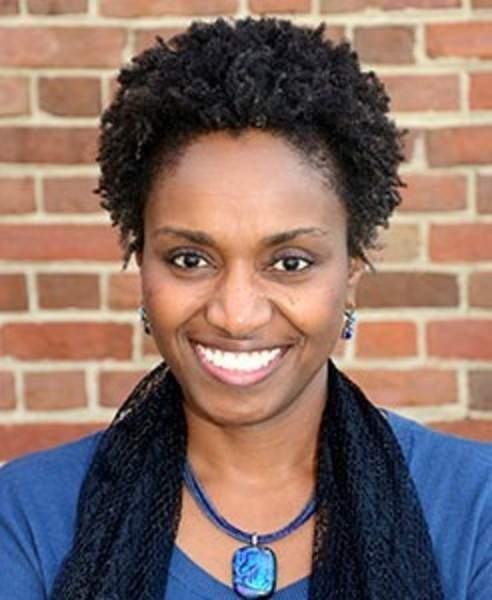 Sharon Tubbs is a community liaison for the St. Joseph Community Health Foundation.